J H (1956) The 19 ton 41 foot wooden oil screw fishing vessel J H foundered March 20, 1956 off of Kodiak. J J (1926) The 15 ton gas screw JJ was broken up and abandoned as unfit after the engine and fittings were salvaged on August 16, 1926 at Kodiak by owner and master J A Johnson. J T ROBINSON (1921) The 18 ton wooden gas screw J T Robinson foundered and was lost along with five crewmen at 3:00 p.m. Wednesday October 5, 1921 on the Ahrnklin River Bar. The salmon vessel was departing the Ahrnklin River bound for Yakutat and had no cargo aboard. Weather was reported as bad with a southerly heavy wind and sea. Lost were Bernard Knudsen, Andy Bergford, Ed Batton, John Terwick and Albert Iverson. The J T Robinson was valued at $6,000 and had no insurance. JABEZ HOWES (1911) The 219 foot three masted wooden sloop and cannery tender Jabez Howes drug anchor in a heavy storm at 4 a.m. Friday April 7, 1911 in Anchorage Bay near Chignik Alaska. The vessel departed Astoria March 14, 1911 with a Chinese Cannery crew of 87 men aboard and a ship’s crew of 37 bound for Chignik Bay. She was carrying supplies and machinery for a cannery and fishing supplies valued at $90,000 as cargo. All those aboard were safely removed during the heavy storm that stranded the Jabez Howes, but the vessel later slipped into deep water and became a total loss. Some cargo was salvaged. JACKIE JAY (1989) The 44 foot steel longline halibut fishing vessel Jackie Jay capsized and sank September 8, 1989 in Ursus Cove in the Barren Islands. All four crewmembers escaped to a life raft where they drifted for four days until rescued. JADE ALASKA (2007) The 122 foot steel cod fish tender Jade Alaska flooded her engine room and sank February 20, 2007 at the south end of the Shelikof Strait near Kodiak Island. The vessel began taking on water over the port rail, began flooding the port void and rolled over on her port side. Dewatering pumps were ineffective. A May-Day was broadcast on Channel 16 and another call was sent out to the F/V Chisik Island. The crew abandoned ship to a liferaft and the Jade Alaska sank within 15 minutes. The EPIRB stored aboard the liferaft was energized and a second EPIRB aboard the vessel self deployed. All three crewmembers were rescued from the life raft by a U S Coast Guard Helicopter. JAGUAR (1964) The 98 ton 64 foot steel oil screw Jaguar was reported lost in the Good Friday earthquake of March 27, 1964. The Jaguar operated out of the Port Bailey Cannery of Kadiak Fisheries Company in Dry Spruce Bay on the north end of Kodiak Island in Kupreanof Strait. JAMES SENNETT (1901) The 195 foot 693 ton wooden four masted schooner James Sennett stranded in Unimak Pass and was lost at 10 p.m. Wednesday August 7, 1901 midway between Scotch Cap and Cape Sarichef. According to the Wreck Report filed by Captain John F Colstrup October 15, 1901, the crew of 12 all survived the disaster. The James Sennett was valued at $56,000 of which almost all was lost, no insurance. They had departed Saint Michaels July 27, 1901 bound for Port Townsend, Washington. The vessel was in ballast with no cargo. The conditions at the time were said to be thick weather, dark, tide rips and scuttle breeze. Charts are now marked Sennett Point just north of the wreck site. JANICE M (1990) The 47 foot fiberglass longline fishing vessel Janice M caught fire from a leaky gas can placed near the cook stove and was abandoned September 23, 1990 off of Cape Hinchinbrook. All three crewmembers escaped the burning vessel. JANIE (1965) The 12 ton 29 foot wooden gas screw fishing vessel Janie was consumed by fire August 15, 1965 at Naknek. JARL (1973) The oil screw Jarl foundered and was lost September 16, 1973 in Bristol Bay. JAVA (2004) The 39 foot fishing vessel Java capsized and sank in deep water August 8, 2004 in the Shelikof Strait near Uyak Bay. The crew was hauling a load of salmon aboard when the disaster occurred. All crewmembers were rescued from a skiff hours later by the fishing vessel Lady Aleutian. 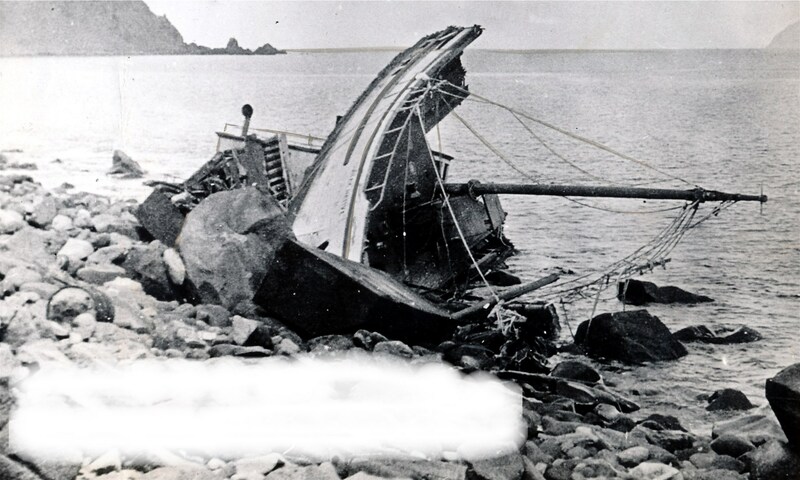 JEAN O (1955) The 13 ton 39 foot wooden oil screw fishing vessel Jean O burned September 26, 1955 at Controller Bay. JEANE (1943) The 36 ton 58 foot wooden gas screw Jeane was consumed by fire at Cordova June 24, 1943. JEANNETTE F (1966) The 67 foot wooden diesel powered fishing vessel Jeannette F was lost after a collision with the vessel Rosemary September 13, 1966 at 57 27 N 152 15 W.
JEANNE MARIE (2000) The 30 foot fiberglass gillnet salmon fishing vessel Jeanne Marie flooded from the stern and was lost June 29, 2000 in Nushagak Bay 10 to 15 miles south of Ekuk. Both crewmembers were rescued from the water by the fishing vessel Norquest and taken to Dillingham by the fishing vessel Snookie. JEFFERY ALLEN (1978) The 75 foot vessel Jeffery Allen foundered August 24, 1978 southwest of Puale Bay on the Alaska Peninsula. Three of the four crewmen, Rusty Slayton, Jeff Slayton and Mike Carroll were rescued by the vessel Cape Fairwell. The fourth crewman, Don Corzine (28) from Brookings, Oregon was lost with the Jeffery Allen. The vessel was salvaged in October of 1979. Source: 1. Unofficial Wreck List, 2. Communication to alaskashipwreck.com from crewmember of sister ship (January 15, 2016). JENNIE D (1997) The 35 foot herring fishing vessel Jennie D grounded and sank after experiencing engine failure February 28, 1997 one mile south of Cape Paramanof, Afognak Island. Both persons aboard abandoned the vessel to a skiff and were later rescued by the U S Coast Guard Cutter Roanoke. JENNY (1989) The 52 foot converted landing craft fishing vessel Jenny experienced a mechanical failure that caused the vessel to sink September 17, 1989 near Seal Rock southwest of Seward. Both crewmembers made it to safety. JEREMIAH (1980) The 42 foot fishing vessel Jeremiah caught fire and sank May 1, 1980 two miles north of Tonki Cape. The two crewmen aboard were rescued by the Alaska Marine Highway ferry Tustamena. JERRY (1953) The 16 ton 52 foot wooden gas screw fishing vessel Jerry was consumed by fire May 20, 1953 in the harbor at Cordova. JESSIE MINOR (1911) The 129 foot 261 ton wooden schooner Jessie Minor was blown ashore in a gale in Nelson Lagoon at noon Thursday August 3, 1911. The crew of 11, with owner W S E Jorgensen of San Francisco as master, all survived the tragedy. The Jessie Minor, valued at $10,000 became a total loss. The $20,000 worth of salt and empty barrels weighing 200 tons was salvaged. Conditions at the time were reported as a 40 mile wind and rough seas. JIM (1994) The tug Jim was scuttled in deep water March 4, 1994 just south of Fourth of July Creek near Seward. JIM ALICE (1964) The fishing vessel Jim Alice was destroyed by a tidal wave March 27, 1964 at Valdez. JO (1958) The 11 ton 31 foot wooden gas screw fishing vessel Jo was consumed by fire July 24, 1958 at Canoe Pass in Prince William Sound. JO (1964) The 12 ton 33 foot wooden gas screw fishing vessel Jo was destroyed by a tidal wave March 27, 1964 at Valdez. JOANNE (1964) The 12 ton 39 foot wooden oil screw fishing vessel Joanne was reported lost at Kodiak in the Good Friday earthquake of March 27, 1964. JODOHA (1964) The 9 ton 35 foot wooden oil screw fishing vessel Jodoha was destroyed by a tidal wave March 27, 1964 at Valdez. JOHN AND OLAF (1974) The 161 ton 80 foot steel oil screw fishing vessel John and Olaf iced up in a severe storm in Portage Bay January 16, 1974 and washed up on the rocks in Jute Bay. All four crewmen were lost. Aboard were John Blaalid, Arthur H Gilbert, David A Gilbert and Ivar Gjerde; all Kodiak residents. The icy winds at the time were reported at over 100 miles an hour and seas at 40 feet. The empty life raft from the John and Olaf was found days later about 50 miles south of Jute Bay near Tugidak Island. JOHN CURRIER (1907) The 236 foot 1945 ton wooden ship John Currier stranded on a sand bar near Cape Rozhnof near Nelson Lagoon at 1:30 a.m. Friday August 9, 1907. She had departed Nushagak August 4, 1904 with a crew of 105 and 140 other employees, bound for Astoria, Oregon. She also had a cargo of about 2,200 tons of canned salmon worth $125,000. At the time of the tragedy there was a strong inshore current, fresh westerly wind, thick fog and rough sea. The ship was full of water two hours after striking. All hands were landed in ship’s boats August 9th. The Revenue cutter McCullough took them from Nelson’s Lagoon September 11, 1907 to Unalaska. The John Currier broke up in a SW gale September 10, 1907. The vessel was worth $20,000 and had no insurance. The cargo was insured for about $125,000. JOHN D (1968) The gas screw John D was consumed by fire June 29, 1968 near the small boat harbor at Homer. JOHN F MILLER (1908) The 107 foot 170 ton wooden schooner John F Miller parted her anchor chains in a severe gale and stranded at East Anchor Cove on Unimak Island January 8, 1908. There were 7 crew and 30 fishermen aboard bound for Bear Harbor. The crew of the John F Miller was attempting to salvage the 127 ton cod schooner Glen, which had wrecked in East Anchor Cove under similar conditions several months before. Both vessels were owned by Pacific States Trading Company. Survivors were picked up by boats from the fishing station after daylight. 10 perished in the disaster. Lost were Harry Hanson (48) of Sweden, Pete Johnson (24) of Norway, Samuel Smith (42) of the U.S., Charles Stoppy (23 ) of Finland, C Flink (38) of Finland, K Lund (27) of Norway, A Christensen (26) of Norway, Gust. Holmlom (48) of Finland, F Wideken (32) of Germany and C. Nelson (28) of Denmark. The John F Miller was valued at $6,000 and was carrying a 220 ton cargo of salt and provisions valued at $4,000. All was lost. The insurance on the vessel was $1,500 and there was none on the cargo. JOHN HANCOCK (1893) The 144 foot 168 ton wood cod fishing schooner John Hancock broke loose from her moorings at the Sand Point Wharf and stranded during a hurricane at 7:30 a.m. Wednesday March 7, 1893. The eight crewmen escaped to safety, but the vessel, valued at $6,000 and her 80 ton cargo of salt and provisions, valued at $2,000 were totally lost. There was no insurance on the John Hancock and only $1,000 worth on her cargo. The John Hancock had been constructed at the Boston Navy Yard as a government tug in 1850 and then became a practice ship at Annapolis MD at the Naval Academy a year later. She was later armed with brass six pound cannon and sent to the Gulf of Mexico as a man-of-war. She returned to New York and then on to Boston where she was refitted and became Commodore Perry’s Flagship. Later the John Hancock was in service with the state department and finally acted as a powder magazine in Mission Bay on the west coast. Her colorful career was ended as a cod schooner at Sand Point, Alaska March 7, 1893. JOHN HENRY (2010) The 34 foot gillnetter John Henry flooded and sank in central Cook Inlet July 15, 2010. Good Samaritan fishing vessel Shadow Line and the U S Coast Guard responded to the John Henry’s distress and Coast Guard helicopter R6013 hoisted the two crewmembers aboard as the vessel sank. JOHN JASON (1983) The crab fishing vessel John Jason flooded and sank February 5, 1983 in Knight Island Passage, Prince William Sound. JOHN P GAINES (1943) The 7,176 ton 422 foot steam powered Liberty Ship John P Gaines broke in two and foundered November 24, 1943 at 55 15 N 155 W. Ten lives were lost in the disaster. JOHN STRAUB (1944) The 7,176 ton 422 foot steam powered Liberty Ship John Straub exploded, broke in two and sank April 19, 1944 approximately 20 miles southeast of Sanak Island. 55 perished in the disaster and 15 survived. The John Straub was a U S Army transport ship carrying a highly flammable fuel cargo from Port Townsend to Dutch Harbor. The ship may have hit a Japanese mine or been sunk by Japanese submarine I-180. Some of the crewmembers who perished were Navy Gunners Mate 3rd Class Frank Thomas of Rock Springs, WY, Seaman 1st Class Arnold Arthur Hansen of Spokane, Seaman 1st Class Lon Eudell Condit of Chickasha, OK, Seaman 1st Class Lewis Vernon Esper of Carleton, MI, Seaman 1st Class Richard Paul Hawes of Roseville, MI, Seaman 1st Class William Charles Hayes of Willobee, OH, Seaman 1st Class Anton Elroy Henry Isakson of Merrill, WI, Seaman 1st Class Joseph Edward Jenkins Jr of Bloomfield, N.J., Seaman 1st Class Edgar Napier of Roark, KY, Seaman 1st Class Robert Lamar Burke of Bingham Canyon, UT, Seaman 1st Class Jesse Cornelius Fishinghawk of Westville, OK, Seaman 1st Class Melvin George Prather of Lafayette, IN, Seaman 1st Class John Mayer of Chicago, IL, Seaman 1st Class Gerald Leon Kline of Long Beach, CA, Chief Engineer Alex Holmquist of Seattle, 1st Engineer Harold W Peter of Seattle, 2nd Engineer John S. Rauen of Seattle, Seaman Archibald Clark of Seattle and Purser James Boyd of Seattle. JOHN-WAYNE (1964) The 16 ton 34 foot wooden oil screw fishing vessel John-Wayne was consumed by fire January 25, 1964 at Alitak. JOSEPH PULITZER (1920) The 73 ton 75 foot two masted gas screw power schooner Joseph Pulitzer foundered at Aniakchak Bay December 18, 1920 while on a mail run from Seward westward. The 8 persons aboard made it to safety. The vessel was originally built for N Y Times publisher Joseph Pulitzer as a gaff rigged schooner but later became a pilot boat in New York and later the Columbia Bar. Power was added in 1920 and the vessel was put to service as a mail carrier between Seward and the Aleutians. JOY SEAS (1990) The 32 foot fishing vessel Joy Seas grounded and was lost October 19, 1990 in Bass Harbor, Prince William Sound. All five crewmembers were rescued by a U S Coast Guard Helicopter. JOYCELYN (2001) The 50 foot salmon seiner Joycelyn capsized September 1, 2001 near Warren Island 75 miles northwest of Ketchikan. An empty fish hold with a seine and seine skiff on the deck may have led to the instability of the vessel. All four crewmen were rescued by the U S Coast Guard Cutter Anacapa. Three of the crewmen were only wearing floatation devices and suffered from hypothermia. The fourth had on a survival suit and did not require medical treatment. Salvage of the Joycelyn was under consideration. JUBILEE (1961) The 30 foot wooden gas screw fishing vessel Jubilee foundered in Prince William Sound in 1961. JUDY (1964) The 12 ton 30 foot wooden oil screw fishing vessel Judy was destroyed by a tidal wave March 27, 1964 at Seward. JUDY K (1970) The gas screw Judy K was consumed by fire August 19, 1970 at Old Harbor. JUDY M (1994) The 33 foot fishing vessel Judy M was consumed by fire August 2, 1994 near Ouzinkie. The two persons aboard were rescued. JULIA FOARD (1888) The 137 foot 446 ton wooden bark Julia Foard stranded in the Karluk River and was lost at 4 p.m. Thursday April 27, 1888. She had departed Astoria, Oregon April 12, 1888 with a crew of 12, 25 Chinese cannery workers and 450 tons of general merchandise for the salmon cannery. There were 17 aboard when the tragedy occurred, but all escaped to safety. The Julia Foard, worth $12,000 and her cargo, worth $30,000 were reported as total losses. The crews were taken to San Francisco by the Francis Alice. JUNE (1946) The 20 ton 43 foot wooden gas screw June foundered in Yakutat Bay October 1, 1946. JUNIOR (1955) The 60 ton 65 foot wooden oil screw fishing vessel Junior burned October 30, 1955 at Deep Bay near Cordova. JUNO (1961) The 30 ton 47 foot wooden gas screw fishing vessel Juno foundered September 21, 1961 at Jap (Japanese) Bay on Kodiak Island. JUPITER (1981) The 82 foot steel fishing vessel Jupiter ran aground and was lost in February of 1981 on Sozavarika Island. The vessel was returning to King Cove with a load of Tanner crab when she ran on to a rocky beach at high tide. A navigational error by an inexperienced crewman was thought to be a contributing factor. The Jupiter and her load of crab were total losses, but the skipper and four crewmen were rescued. i have found part of what i think is the jabez howes. it is a small chunk of the mast, and i dont know where to go from here. I would let Dave McMahon, who is the current State Archaeologist know about your discovery. His is retiring at the end of the month, so time is of the essence. I have heard he is very helpful in these matters, and I don’t know who his replacement will be. I will send you an email with his email and phone number.